In Vietnam, there was no "front" like there was in WW2 or Korea. It was a different kind of war with different problems. The enemy could be and usually was at any location. The "come out and fight then hide" led to convoys now dealing with a enemy that was capable in doing just that. A transportation group in the highlands was mounting "unacceptable losses" as stated by there commanders so something had to be done. 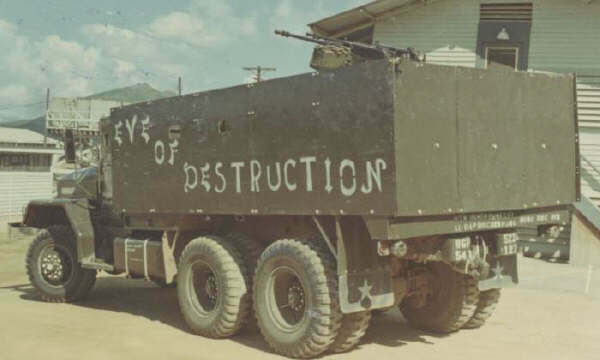 This began the "Hardened Convoy Concept" and the birth of the Gun Truck. "We had been out on the road (QL-1), all day. 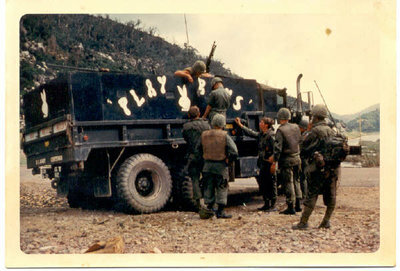 I was a new driver on the Gun Truck THE PLAYBOYS. THE BOSS Gun Truck and a Gun Jeep THE PLAYBOYS BABY was doing the same as us. 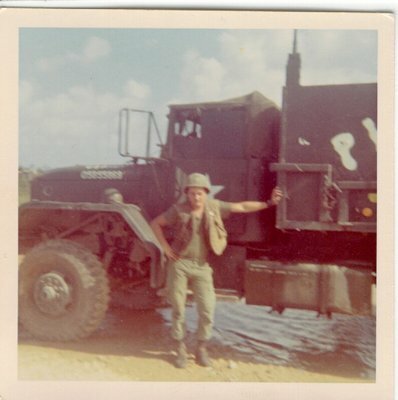 We were a roving patrol between Vung Ro Bay and Phu Hiep area, we diden't do as many convoys as other gun truck companys in Vietnam. We were behind the last cargo truck out of Vung Ro for the day. The Gun Jeep was headed towards us and the NCOIC Sgt. MC Williams signal'd me to stop. I stopped at a old train station. There was a set of train tracks on a curve and the jeep was traveling too fast and the weight of the armor and ammo was too much for the drive line. 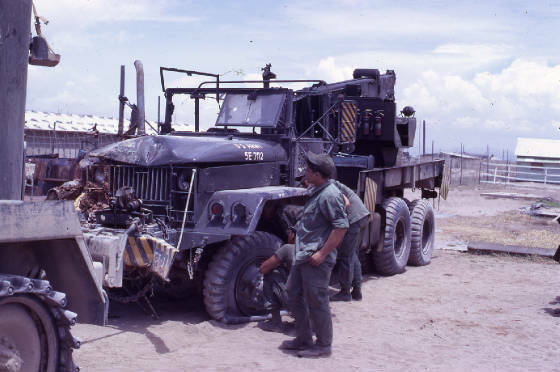 Sgt MC Neely was the NCOIC of the Gun Jeep and he called for a wrecker. Two men came out on the wrecker, a driver Ron Quinn, a red haired SP5 and riding shot gun was Melvin Green. They had the jeep hooked and ready to roll in a short time. It was just getting dark as I remember, and we drove a 1/4 mi and the wrecker entered a curve in the road known as the ROCKING CHAIR or DEVILS PLAYGROUND. It was a known hot spot. It was a mountain of rocks on our left side with a 6" JP4 fuel line above ground laying next to the road. On our right was rice paddies and a 4' drop. I was driving about a 100 meters behind them. 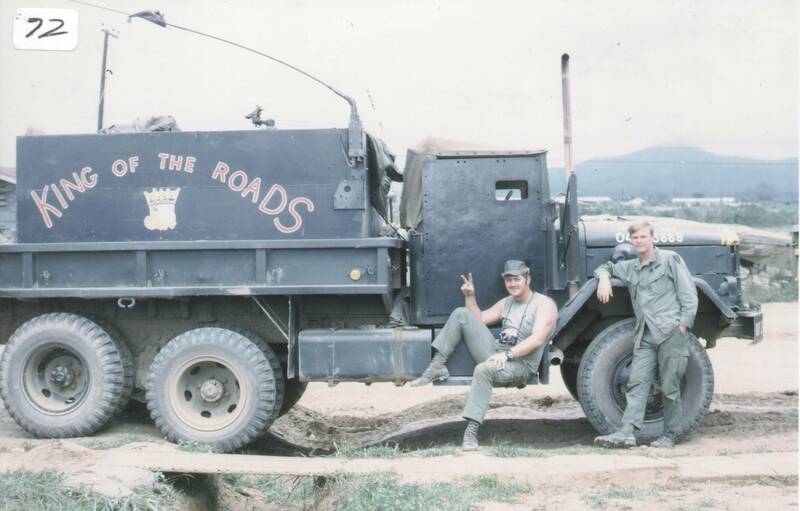 Sgt Mc Neely and his driver was in the jeep, Sgt Mc Williams was on a M60 and we had a 50 gunner with us. There was two big explosions almost at the same time(cab high). The wrecker and gun jeep was blown off the road into the rice patty. I could not believe what I just seen, and was calm till all the shooting started, I could hear the rounds hitting the armor of the gun truck. 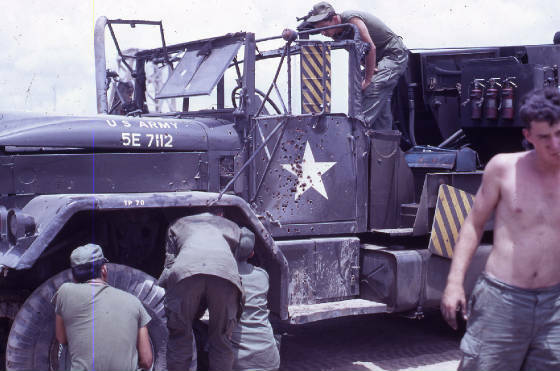 Our 50 gunner was retrurning fire as Mc Williams was pulling up my armor to cover the windshield except for a 3x6 inch hole for me to see through. Mac was yelling at me not to stop in the kill zone. The PLAYBOYS took a rocket there before and we had heard from the soda girls that Charlie was out to get the gun trucks. Mac wanted me to make passes until help arrived. I was a new truck driver and new in Vietnam and as I turned around for each pass I was crushing the JP4 line. It was a alluminum line, and the fuel was all over the road. I was trying to tell Mac that if the JP ignited we would all be dead. Mac was too busy returning fire with the M60 to care about what I was thinking. THE BOSS came back with all its guns blazing. Tom Utash was as new as myself and was the driver of THE BOSS. Sgt Walls was the NCOIC. THE BOSS stopped in the kill zone. Then I stopped and then Mc Neely opened the door and climbed in and told me that Quinn and Green were both dead. He was screaming it and had tears in his eyes. Mc Neely's driver and Utach were loading the bodies on THE BOSS. All this time the shooting never stopped. 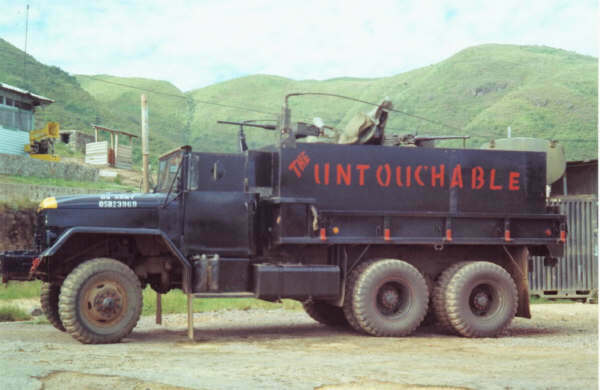 We had the Gun Trucks between the wrecker and jeep and the mountain. Mc Williams had called in the Gun Ships and they were arriving as we pulled out of the kill zone." Ron Jones 545th Trans. Co. These pics surfaced many years later after Ron wrote is account on the ambush for me. Ron Green and Melvin Quinn KIA. "This Concept, is dynamic and revolutionary. It has made charlie think twice befor hitting us and suffer the consequences when he does"